A museum dedicated to artworks created by coal miners is to open in County Durham. The Mining Art Gallery in Bishop Auckland has 420 pieces including paintings, drawings and prints. It aims to showcase the hidden underground lives of pitmen and features artists Norman Cornish, Tom McGuinness and Bob Olley. The gallery, which is part of a wider regeneration plan for Bishop Auckland, is due to open on 21 October. Mr Olley, from South Shields, worked underground for 11 years. 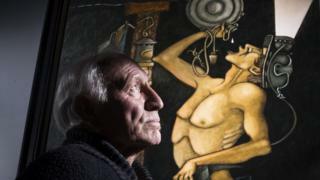 The 77-year-old said he felt mining had inspired a genre of art which other industries like shipbuilding or steel had not. He said: "In days gone by, before cameras and mobile phones, you couldn't show people, 'that's what I do at work'. "I think that may be part of why there's so many people who came out of coal mining being artists. "We are lucky because we have had the exposure, but there must have been thousands of other people in the industry that didn't, and nobody has seen their work." The gallery has been a long-held ambition of mining art collectors, Dr Robert McManners and Gillian Wales. Dr McManners said Mr McGuinness was a patient of his who had shown huge determination to learn to paint, walking miles to get home from night classes after a shift down the pit. Former librarian Ms Wales said she was delighted with the gallery, but said she had "empty nest syndrome" seeing the paintings in a new home.